If you have started to look ahead to how you will market your brand in the New Year, you’re probably looking for something that will effectively promote your brand but why not also market in a way that will resonate with your customers and the environment? Drawstring bags appeal to so many consumers so you should definitely consider making it your next marketing item. There are so many advantages to promoting your brand with customized drawstring bags. Reusable bags are effective marketing tools because when they are customized with your branding info and your customers carry your branded bags the bags work almost like a sign, so your customers are essentially carrying a sign with your branding info and showing it to everyone whose path they cross. This is great exposure for your brand. Drawstring bags take things to the next level because unlike grocery bags that may be used once or twice a week, a drawstring backpack is likely to be used several times a week, possibly daily if your customers use it for school or work. This offers your brand an unparalleled amount of exposure. Drawstring backpacks are designed to be worn, so when your custom wears it on their back your marketing info will be clearly visible and unobstructed. Anyone walking behind your custom will easily see your branding info and internalize your message. Bags that are designed to be reusable are green since they eliminate the need for single-use disposable bags. The durable design ensures the bag will hang in there and deliver dependable use and it will be something your customers can count on. There is also a lot of value to giving your customers and prospects something they need and can use. This helps foster a rapport between your customers and your brand and will give them a reason to appreciate what you do for them. 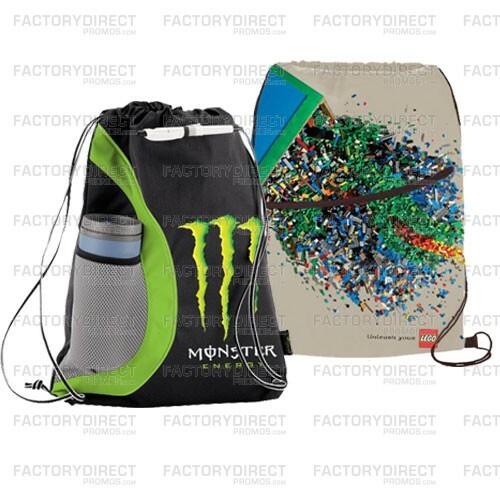 Opting to create your promotional drawstring bag from recycled or sustainable materials further ups the green ante. Using recycled fabrics gives a new use and purpose to materials that are all too likely to end up in landfills or as litter. Giving these materials a new use ensures these materials are used in an eco and responsible manner. Sustainable fabrics are green because they are natural plant fibers, so while they were in plant form the converted greenhouse gases into breathable oxygen and after they are woven into fabric, they can be recycled into new fabric and have no negative impact on the environment. What Can A Custom Drawstring Bag Do For Your Brand? Whether or not you’ve started putting together your 2016 marketing plan, take some time to think about what a custom drawstring bag can do for your brand. These bags are proven to effectively spread the word about your brand, they offer an incredible return on your investment and they minimize your environmental impact. Do you need a quote? Have questions about the design or ordering process? Fill out a product quote request located on each page of our site or let us know and we can help you get on your way to making 2016 the year your brand uses drawstring bags to promote your brand in an eco-friendly and smart way.